This game isn’t New Super Mario Bros. This game isn’t Nintendogs. This game isn’t Imagine Babiez. This game is unlike any other game I’ve ever played and will consistently make my personal top five forever. The World Ends With You is a little title on the DS that was critically acclaimed but I do not believe will earn a sequel. In a way this annoys a fan of the game like myself but on the other hand I adore the fact that the game stands alone and remains untouched or possibly spoiled, by a sequel. The game is the brainchild of Tetsuya Nomura, the golden boy of Square-Enix. Being the lead character designer of nearly every Final Fantasy since VII, he is well known and highly regarded among gamers. If one was to sum up his style into one single game it would be The World Ends With You. The game has three things about it that make it an essential part of any gamers collection as well as entirely unique – the game mechanics, the story and the design. 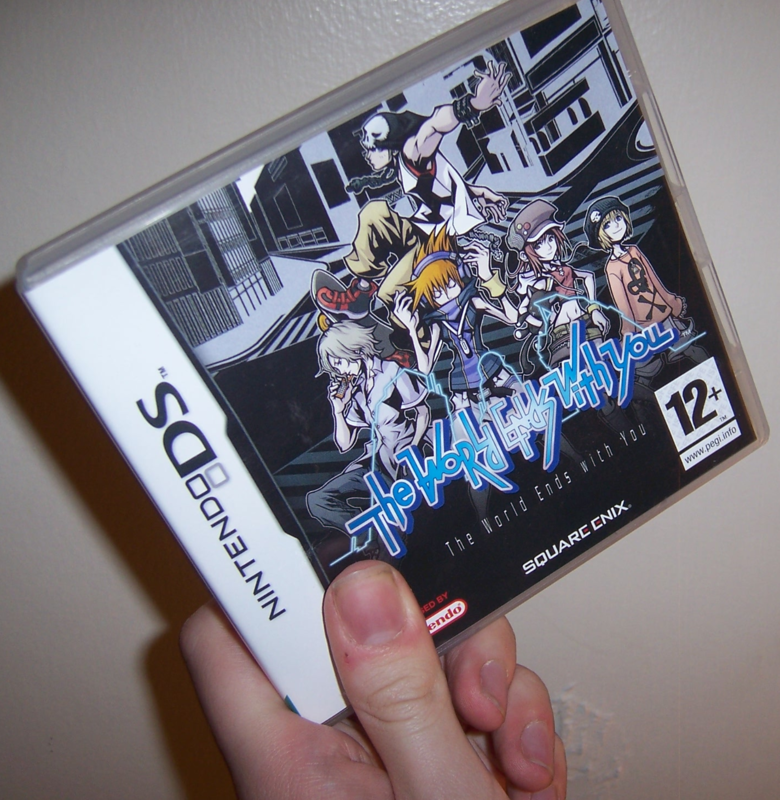 The game mechanics were what first drew me to the title – no other game takes advantage of the two screens on the Nintendo DS like TWEWY. You control two characters at once during the battle scenes of the game. You control the character on the bottom touch screen with the stylus. On the top screen you use the directional pad or buttons depending on what hand you’re using for the stylus. In each battle you fight using both characters at the same time. It sounds mind boggling but it is something you get acquainted with eventually, and it quickly becomes second nature. This battles are fervent, exciting and fun – something which has become the norm for current Role-playing games, but is already fairly perfect in TWEWY. The story is set in an alternative modern Tokyo. Your characters are players in “The Game”, trapped in a parallel limbo where they must survive seven days of puzzles, enemies and challenges in order to be set free and granted one wish. What begins as a stereotypical Japanese drama fodder, escalates into a epic that is full of twists, surprises and memorable characters that will keep you coming back for more. The game looks like a cross between tokyo fashion, anime, graffiti and tribal tattoos. The eponymous Nomura style is omnipresent in the game with players emblasoned with his signature belts and zips – but within this world they fit perfectly. The art of this world will be just one of the many things leave you wanting to replay and make the characters your desktop wallpaper. You need to play this game. The Awesome Geek already knows and loves The World Ends With You – and you should too. This entry was posted in Video Game and tagged Neku, Nintendo DS, Review, Role-playing Game, RPG, Shiki, Tetsuya Nomura, The World Ends With You by Jonathan Day. Bookmark the permalink.